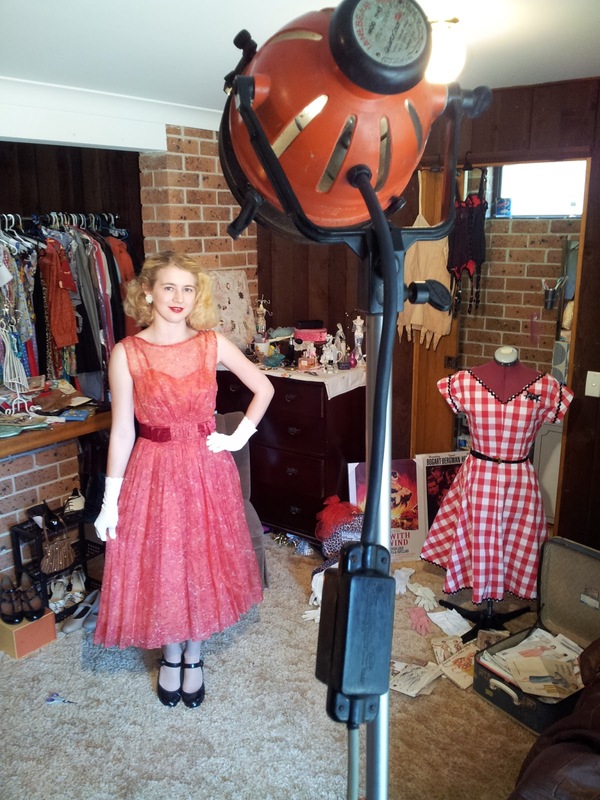 GracefullyVintage: Photoshoot/Behind the Scenes - Part 1! I had a photoshoot/filming session today with my boyfriend's mum for a film project she working on! I am honored that she chose me as part of her film subject to make her vision happen! I will go more into this when I am allowed to reveal it all and once she has finished the filming/editing process! Some of these photos are behind the scenes shots and some proper images of myself photographed by Nat! Oh and these photos were taken in my bedroom amongst most of my vintage stuff! We didn't get a chance to photograph every little thing I have (that would take ages haha) but here is a good look into my room - mainly just one section of the bedroom! With my clothes that I love so dearly... Haha! Behind the scenes shot! Leo and Fifi were watching the whole time! Behind the scenes shot! Most of my dresses and some of my accessories laid out for shooting! Behind the scenes shot! Fifi! Happy snaps with Leo who wanted to be in some of the photos! Some of my vintage stockings. This was the first ever 1950s vintage dress I ever got and that was about 3.5 years ago now! I bought it for my school formal and it was a great way to finish my high school years... For years and years I had always loved vintage fashion and old Hollywood film and to finally have a vintage dress this amazing made me so happy! I eventually started buying more vintage dresses and vintage reproduction and I'm very proud of my wardrobe. This dress is so delicate now that I mainly just wear it for photoshoots: The colours, cut and attached belt are just so perfect! I'm so glad that the camera is always able to capture the beauty of the dress. I'm so happy with these wonderful photos that Nat captured and it's always nice to have my dogs in some of the photos too! There will be a few more posts over the next week or so! I hope you enjoyed part 1! You look adorable! I also love the 1950s style. Your doggy is so cute. Beautiful! Where you find your gloves? I saw few on instagram ;). This is heaven. I could be in your room for days, and watch all that beauty!